A few weeks ago we had some fun with the Russian Penny Black and its corner letters. 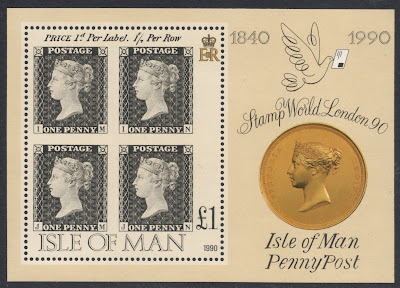 It made me realise that, having no funds no play around with the real thing in any significant way, it is just as great to play around with a ‘Penny Black on Stamps’ collection. 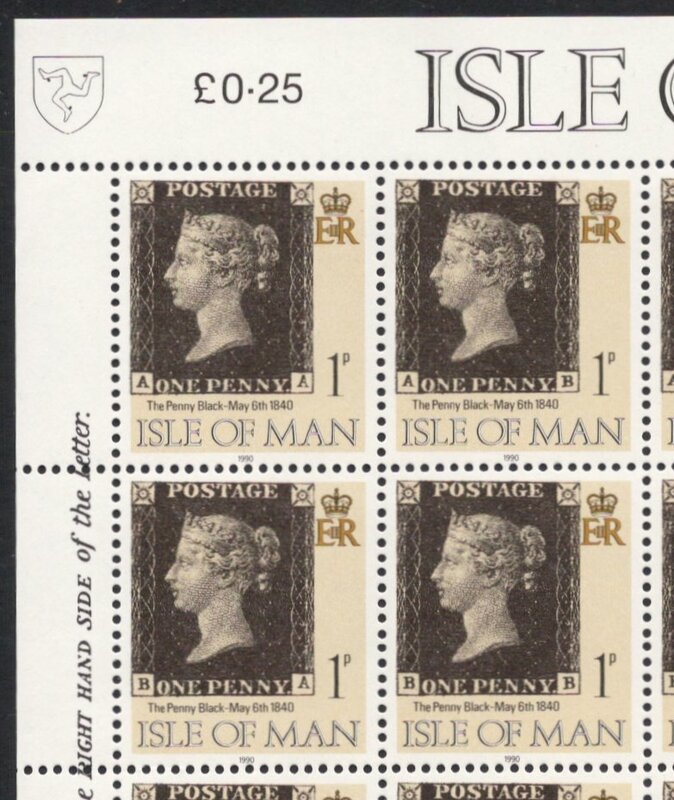 Case in point: the 1990 Isle of Man issue to mark the 150th anniversary of the famous stamp, which is also featured in the August issue of Stamp Magazine. There were actually a number of items issued, all with their own particular interest. 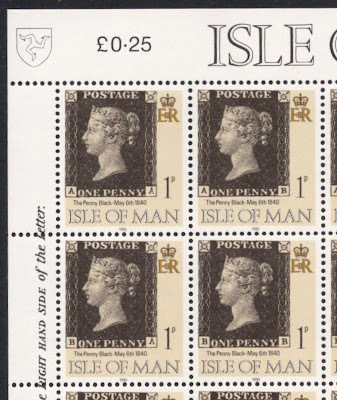 The above illustration is that of the five-stamp sheetlet with designs showing the development of the Penny Black. It shows the medal head on which the engraving was based, some preliminary art work and the two finished articles. 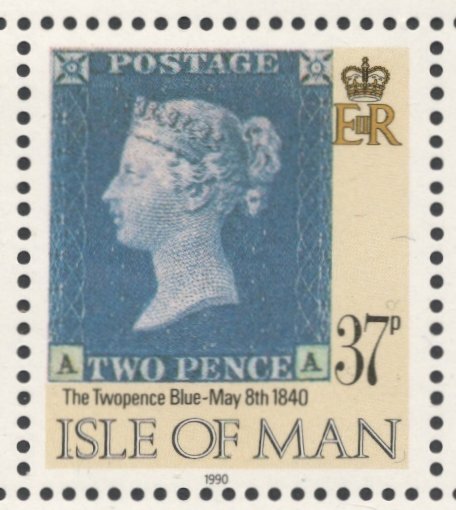 Note how this was the time when we were still thinking that the Twopence Blue was actually issued a few days after the Penny Black. Now, of course, we know that this was not the case and that both stamps were issued on 6 May 1840. You may also have noted that the Penny Black stamp very aptly has a decimal 1p value. 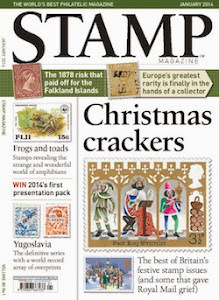 It was the only stamp which was also issued as a normal sheet stamp. It came in sheets of 25, and the added bonus was that the margins of the sheet contained the same wording as the margins on the original 1840 sheets. Also, and this is absolutely great, the 1990 sheet follows the corner letter pattern of the original stamp, so you basically have 25 different stamps to collect. But it gets better! 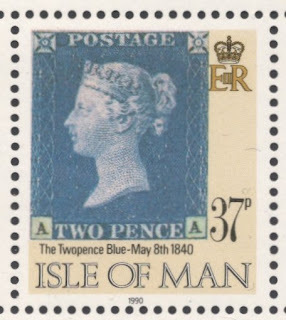 On the actual day of the anniversary, 6 May 1990, Isle of Man residents were allowed to send their local mail using just this 1p stamp. I’ve tried very hard to find a copy or illustration of such mail but that proved fruitless. It would be a fantastic item though! 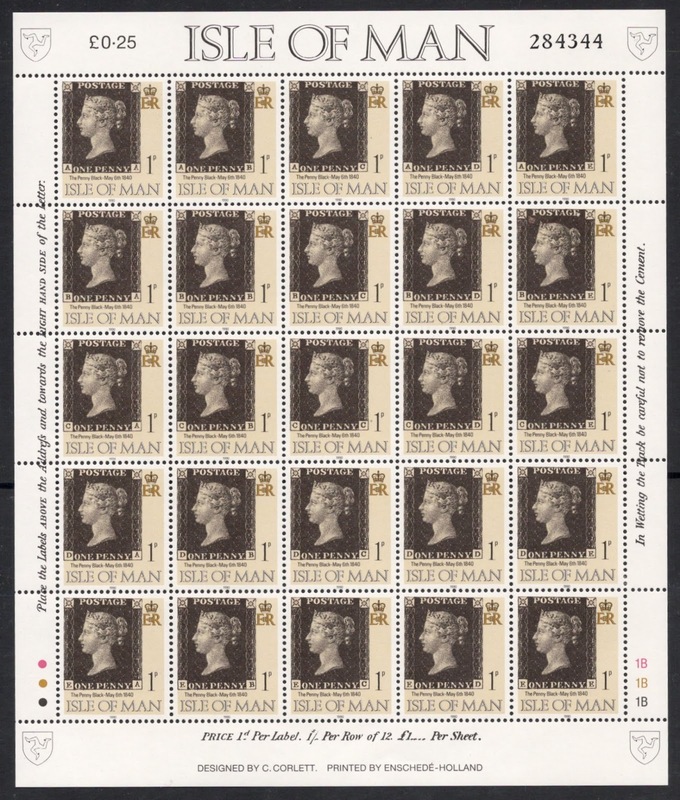 The final item as part of the celebrations was a miniature sheet which simultaneously promoted the international stamp exhibition in London that year. 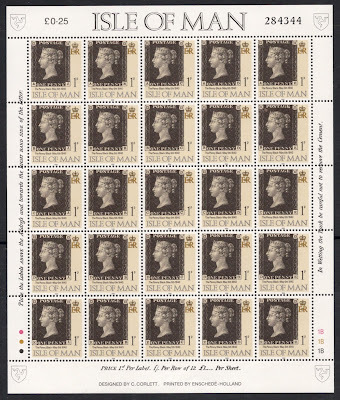 The sheet contains one £1 stamp which has a reproduction of four Penny Blacks. The great thing about this particular item is that the Penny Blacks are properly recess-printed, just like the original. The stamps were engraved by Inge Madlé, and these four also have the added bonus different corner letters, starting with IM at top left. Feel where this is going yet? Well, here’s a puzzlement for you: It is quite obvious that the initials of the island have been incorporated into the design. Or is it? Remember Vladimir Koval? Could she have pulled the same trick...?